I’m not sure what it is about roguelikes that seizes my brain, but it is undeniable. I’ve logged more hours than I care to admit on nethack, Binding of Isaac, and Dungeons of Dredmor. When we received the opportunity to review not just one but several roguelikes, I jumped at the chance and prepared to have several days of my life evaporate. 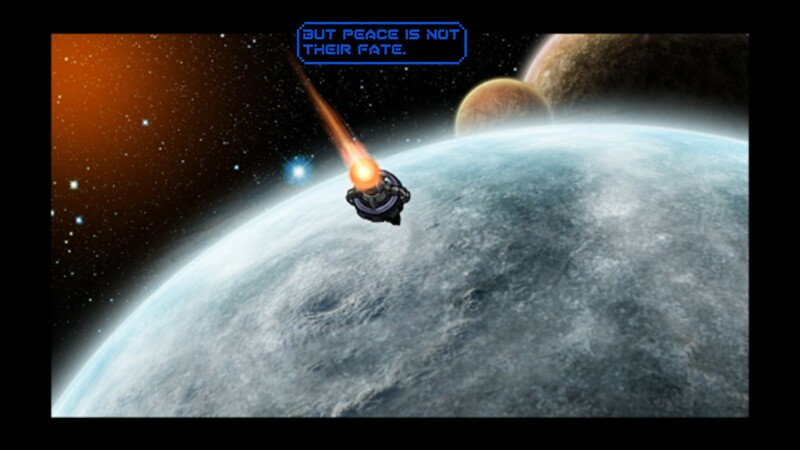 The first up is the game so nice it has two subtitles, Sword of the Stars: The Pit: Mindgames. Ostensibly this review is to be of the Mindgames DLC, but for the sake of those who haven’t played the core game, I’ll be providing an overview of that as well. 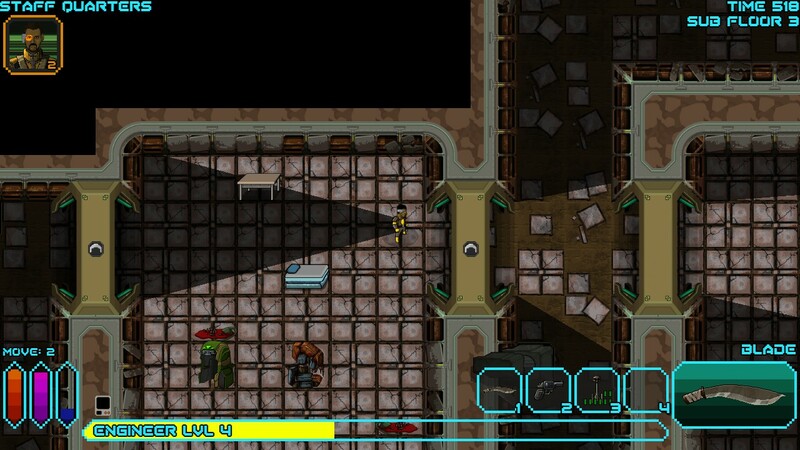 In what is almost a requirement of roguelikes, the visual layout of The Pit is tile based. The artwork is detailed enough, with a varied set of enemies and visually distinctive levels, traps, and items. Roguelikes rely upon a phenomenal variety of items and equipment, and The Pit doesn’t disappoint. Though there are items of various sorts peppered into the game by the DLC, the two key visual additions are the Ranger and Psion characters, one of which is an alien (a Targa) and the other which is a bald Asian man. See? Bald AND Asian! I wasn't lying! I wouldn’t call the graphics impressive, but they are tremendously well-suited to their task. You can identify enemies at a glance that require special treatment, like the ones that do damage to your equipment, or the ones that infect or poison you. The basic items are distinctive, even when they are similar in role—cooked meat is clearly discernible from raw, safe, or tainted meat. In addition, there are randomized features of the game, like door traps or weapon mods, which are color coded so that you can quickly identify which have been proven to be helpful or detrimental. The HUD keeps things out of the way of the main play area, and on the occasion that you need to aim at something hidden by the HUD, tapping the H button will hide it. You even get a mini-map you can bring up that includes scaled down items of interest so that you can swiftly locate tools and chests. The key elements of roguelikes are as follows: random levels which require you to locate the exit and travel downward, unidentified items which may help or hurt you, extreme depth and complexity of inventory and status, permadeath. The Pit has all of these features. There are no stores, so you’ll need to forage for everything you might need, including ammunition and food. 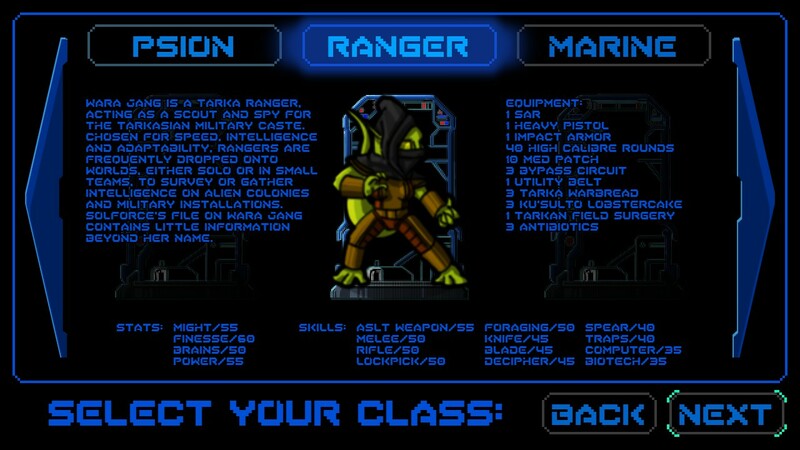 The game offers an assortment of classes: Marine, Scout, Engineer, and the DLC specific Psion and Ranger. Each character has got different starting equipment, stats, and skills. 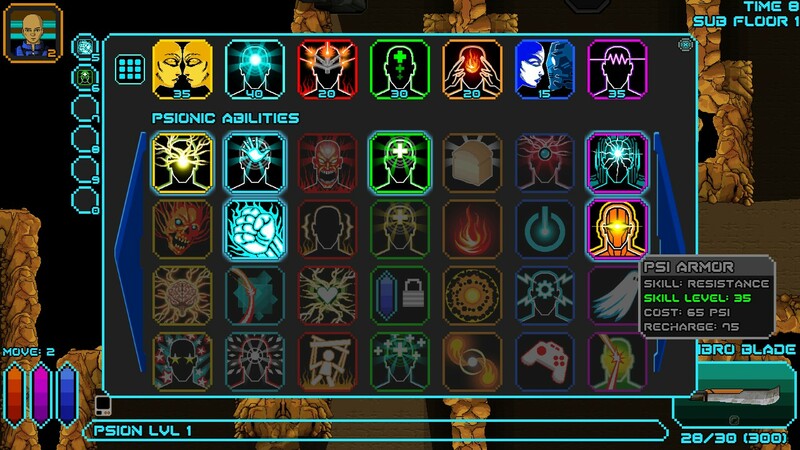 All of the standard RPG elements abilities are there in one form or another. Brains, Finesse, and Might control things like computer skill, accuracy, and melee skill, and the new psi-power attribute handles your psionic skills. It's a roguelike, you'll see this a lot. 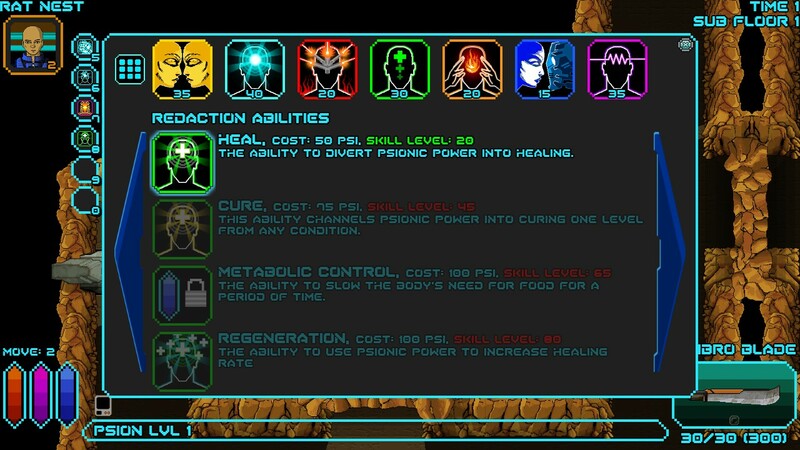 The psi-powers add a significant amount of utility and complexity to the game. 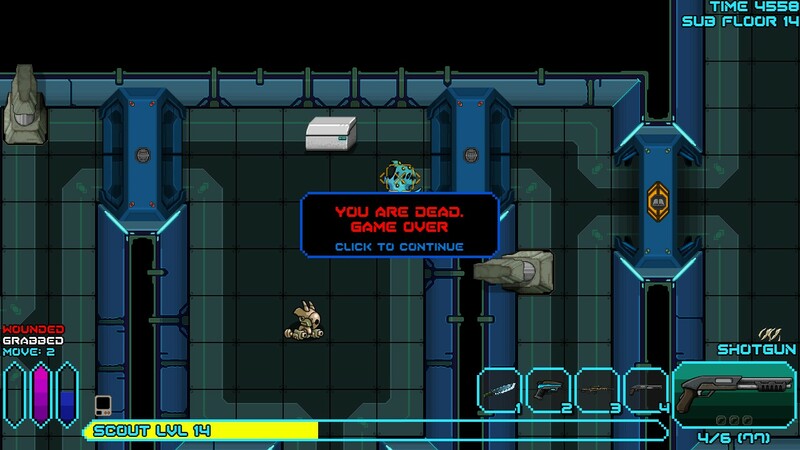 The player now has a psi-energy meter which slowly recharges. This fuels abilities which fall into the categories of empathy, telekinesis, warmind, redaction, manifestation, mecha empathy, and resistance. In a game that is already incredibly deep, these abilities create a great amount of flexibility. Since psi-energy is effectively a free resource, the ability to heal, increase defense, or even manifest food can ease the need to forage for supplies. 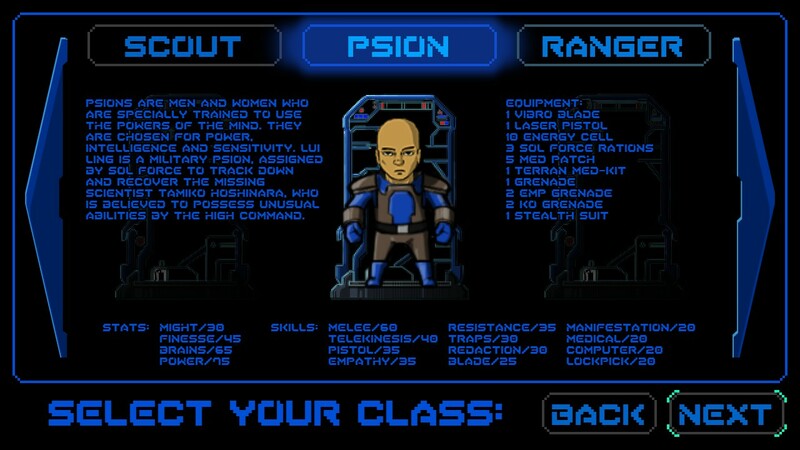 In the case of the Psion class, the TK Fist ability is powerful enough to almost completely take the place of normal weapons in the early levels if used intelligently, allowing players to save ammo for later levels. It is an excellent addition to the game, and feels very natural and well integrated. Likewise, the new items that can be crafted sift into the gameplay well, and each existing class has been updated to make use of the psi abilities to varying degrees. In addition to the Psion and psionic powers, the game adds a Ranger class which is extremely well balanced, very much like the scout, but with a slightly more combat oriented build. I found this to be an excellent starting character, since its abilities were well geared for survival. There isn’t much in the way of music in this game. Instead there is an ominous hum which actually does a remarkably good job at setting the mood. Distinctive animal and mechanical noises serve the same purpose in The Pit as text indicators do in nethack, identifying nearby creatures that you might not yet be able to see. For the audio aspect of the game, the DLC primarily adds the voicework for the two new classes. The Psion has a very zen monk feel to him, while the Ranger has a warrior race feel to her dialogue. She might be my favorite character. The basic story is that on a fringe planet, a retirement home for veterans, a terrible plague breaks out, and the only hope for a cure lies in an alien facility burrowed deep into a mountain range. You must go there to attempt to find the origin and cure for the plague. The DLC doesn’t add much in this regard, other than a pair of characters who are interested in curing the plague. 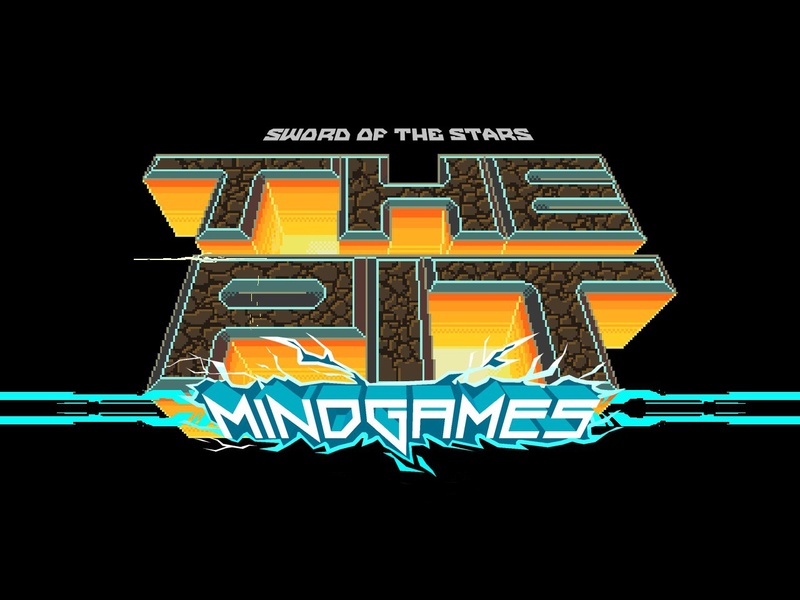 SOTS: The Pit: Mindgames manages to add complexity to an already maddeningly complex game, and yet in the process actually makes the game easier by providing new ways to perform key tasks. Fans of traditional roguelikes should find The Pit to be an excellent game to feed their need, and Mindgames is a great way to expand and enrich the experience. 8.0 / 10: Sword of the Stars: The Pit: Mindgames is a great addition to an excellent update to the traditional roguelike formula. See? Bald AND Asian! I wasn’t lying! It’s a roguelike, you’ll see this a lot.